Former Kiss guitarist says replacing Simmons and Stanley would be a "joke"
Ace Frehley says it’s “ridiculous” to consider the idea of Kiss continuing without any original members. The former Kiss guitarist was replying to previous comments from ex colleague Paul Stanley that the band’s characters could outlive him and Gene Simmons and continue performing when they’re gone. Frehley’s Spaceman persona was taken over by Tommy Thayer full-time in 2002, while drummer Peter Criss’ Catman was handed off to Eric Singer. But Frehley says the idea of Simmons and Stanley being replaced is a non-starter. He tells WZLX 100.7 (via Blabbermouth): “That’s the most ridiculous statement I’ve ever heard them make. I think the only reason they make those statements at this juncture is to try to validate the fact that they have two other guys in the band that aren’t the original members. “So they’re trying to rationalise to the fans, ‘Well, you know, we replaced Peter and we replaced Ace, and eventually we’re gonna replace ourselves. 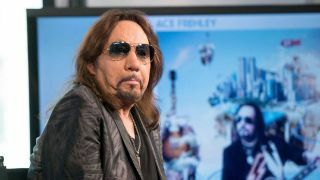 Frehley’s relationship with Stanley appears to be in better shape than it has been for years, with Stanley having guested on Frehley’s upcoming album Origins Vol. 1. Frehley enjoyed the experience so much that he was moved to say he’d never rule out a potential return to Kiss.